DISH’s AirTV player is pretty much all the streaming box you’re going to need. Not only do you get a great experience with live Sling TV, DVR, and even over-the-air channels, you also get so, so much more. You might not have ever heard of AndroidTV. You’ve heard of AppleTV, and you’ve heard of Roku. You might have even heard of Chromecast. Well, AndroidTV is very much like that. Just like AppleTV takes the same software in iPhones and customizes it to work on TVs, AndroidTV does the same thing. In fact, it does it better in a lot of ways. The power of AndroidTV? It’s Android. Android is the phone operating system that powers about 85% of the world’s smartphones. It may have been laughable when it first started, but look no further than the latest from Google, Samsung and others to see that it’s a powerful, flexible, and very polished phone operating system now. There’s practically nothing you can’t do with it. Apple certainly has its fans — I’m one of them — but there’s no denying that Android brings a lot to the table. AndroidTV is an operating system that forms the basis for a lot of streaming hardware. Unlike Apple’s closed-off approach, it’s available for manufacturers to customize. And that’s what DISH did with its AirTV player. It built an experience that puts Sling and its antenna adapter right up front, but it left all the good Android stuff in. In other words, if you can do it with Android on your phone you can probably do it on your AirTV Player. Too many apps to list. I’m talking Netflix, Hulu, HBO Now, ESPN, YouTube, and thousands more. Practically every streaming video app is available through the Google Play store right on your AirTV player. You can even search for them by voice. What’s even better is that if you don’t see an app you still have options. Unlike Apple’s product, Android TVs allow for “sideloading.” Using a free app like ES File Explorer and a few tweaks to your settings, you can load virtually any app on your Android TV that will work on your phone. I will warn you that this is a little bit sketchy. There’s a good tutorial on how to do it here, and there’s a chance you’ll load some app that doesn’t work or messes up your device. This is essentially the same risk you take by going to untrusted app stores on your phone. If you’re comfortable with that then you should also be comfortable with sideloading. Believe it or not you can hook a keyboard and mouse up to your AirTV player and they work great. There are some apps you’d load that work better with touch devices, and having a mouse will generally make it easier to work with those apps. A keyboard also helps a lot when you’re searching. So yes, it really is all you need. 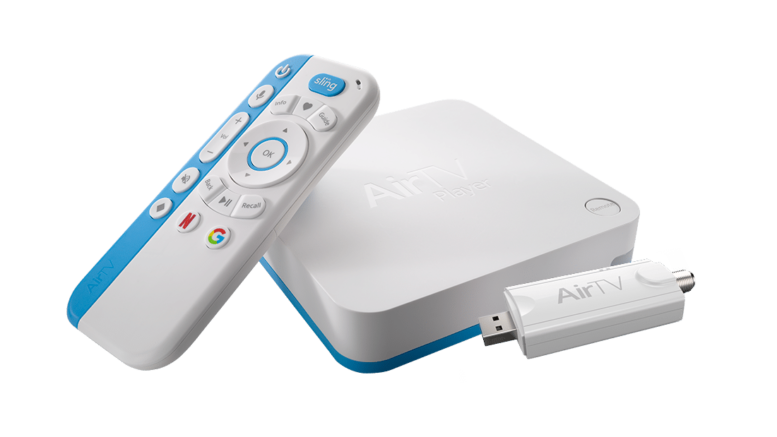 An AirTV Player gives you more than just a smart TV. It’s practically every app you’ll want, Netflix included. It has the best Sling app experience and it even gives you OTA DVR features. Best of all, the voice-activated remote makes it so easy, much easier than the competition. Check it out and you’ll see what I mean! Of course, you’ll find all the great streaming products you’ll need at Solid Signal.